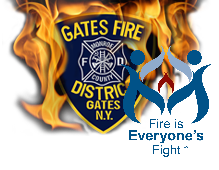 Gates Fire Explorer Post 272 is a Boy Scouts of America Learning for Life program, sponsored by the Gates-Chili Fire Department. It is open to male and female youths 14 years old (who have completed the 8th grade) to 21 year old- who are interested in firefighting. Explorers are trained similar to firefighters and assist the firefighters at working fires & fire prevention details.